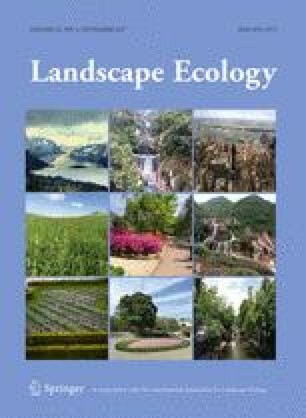 Despite the key role of biological control in agricultural landscapes, we still poorly understand how landscape structure modulates pest control at different spatial scales. Here we take an experimental approach to explore whether bird and bat exclusion affects pest control in sun coffee plantations, and whether this service is consistent at different spatial scales. We experimentally excluded flying vertebrates from coffee plants in 32 sites in the Brazilian Atlantic Forest, encompassing a gradient of forest cover at landscape (2 km radius) and local (300 m) spatial scales, and quantified coffee leaf loss, as an indicator of herbivory, and fruit set. Leaf loss decreased with higher landscape forest cover, but this relation was significantly different between treatment and control plants depending on local forest cover. On the other hand, fruit set responded to the interaction between treatment and local forest cover but was not affected by landscape forest cover. More specifically, fruit set increased significantly with local forest cover in exclusion treatments and showed a non-significant decrease in open controls. These results suggest that services provided by flying vertebrates are modulated by processes occurring at different spatial scales. We posit that in areas with high local forest cover flying vertebrates may establish negative interactions with predaceous arthropods (i.e. intraguild predation), but this would not be the case in areas with low local forest cover. We highlight the importance of employing a multi-scale analysis in systems where multiple species, which perceive the landscape differently, are providing ecosystem services. The online version of this article (doi: 10.1007/s10980-017-0555-2) contains supplementary material, which is available to authorized users. We thank all coffee farmers and employees for giving permission to conduct fieldwork on their lands and for the outstanding support. We also acknowledge Prof. Thomas Kneib for his valuable suggestions regarding statistics. Special thanks to the Lepac (Laboratory of Landscape Ecology and Conservation) staff for their help, hardwork and friendship. Our gratitude goes also to all volunteers that helped in this project for their commitment and dedication. This study is part of the “Interface Project” and was founded by the São Paulo Research Foundation (FAPESP project 2013/23457-6). Authors thank the PAEC-OEA-CGUB program (FLE master fellowship), the Brazilian Science Council (Conselho Nacional de Desenvolvimento Científico e Tecnológico, CNPq; JPM research fellowship process no. 307934/2011-0), and FAPESP (GDC post-doctoral fellowships no. 2012/06866-7 and 2014/14746-7).